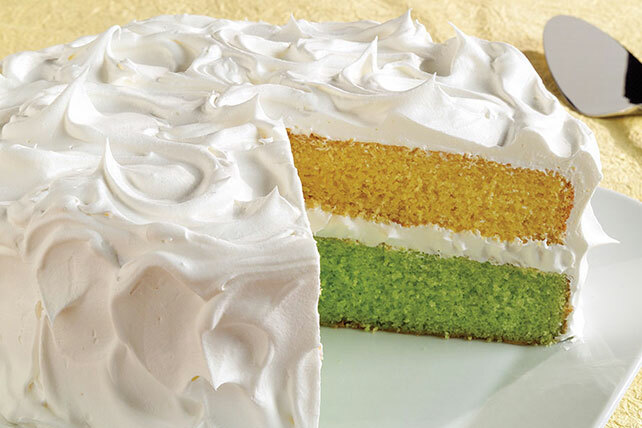 Whether you're celebrating spring or just want a citrusy slice of scrumptiousness, this Pastel Cake with white frosting is a good bet! Cover bottoms of 2 (9-inch) round pans with waxed paper; spray with cooking spray. Prepare cake batter as directed on package; pour half into separate bowl. Add different flavor dry gelatin mix to batter in each bowl; mix well. Pour into prepared pans. Bake 28 to 30 min. or until toothpick inserted in centers comes out clean. Cool cakes in pans 15 min. Invert onto wire racks; gently remove pans. Cool cakes completely. Place lime cake layer on serving plate; spread top with 1 cup COOL WHIP. Cover with lemon cake layer. Frost top and side of cake with remaining COOL WHIP. Mix remaining dry gelatin mixes in medium bowl. Add 1 cup boiling water; stir until mixes are completely dissolved. Stir in 1 cup cold water. Refrigerate several hours or until firm.